Necessity is the mother of invention, and it would take an optimist of considerable conviction to convince me that there is currently no necessity for invention on the high street. When Retail Week used the occasion of the Queen’s Diamond Jubilee to look at the transformation of retail during her reign, the main thing that struck me was that, as eager as the traditional retailers were to extol the virtues of the advances that carried them to success in the last century, the references to bricks and mortar businesses seemed to dry up the second we entered a new millennium. In their place were the big name etailers, Asos and Amazon, representing a generation of start-ups who were unafraid of the status quo and willing to take risks in order to succeed. It is difficult to disagree with the premise that the 21st century has thus far belonged to the young and the brave. If I were to draw one conclusion from what we have learned over the past few years, it is that everything is very much up for grabs. No one could have perceived the seismic shifts we have witnessed, with names we thought would live on forever disappearing at an alarming rate, but I see no reason why this should mean a retreat to playing it safe and knowing one’s place. Independent retail has always been at the forefront of innovation, and if our high streets are to return to their glory days as central hubs of their communities, it is a rejuvenated outlook and fearlessness that will get them there. Not all innovation has to change the world however, and there are so many areas where simple, logical thinking can reap immediate and considerable rewards. Collaboration and dialogue with local authorities is vital, to ensure they maintain a detailed understanding of the challenges and opportunities facing independent retailers, and seek to incentivise rather than penalise wherever possible. A strong high street benefits every single area of a community, and there is a direct correlation between the strength of a high street and the number of thriving, inventive independent retailers keeping the giants of the sector on their toes. Conveniently enough, two weeks before Retail Week looked back, they looked forward, hypothesising as to the high street of the future. The first of their eight points for ‘a new look high street’ struck a chord, stating as it does that “High streets must become less ‘identikit’ and more interesting as they fight for footfall and sales”. Though it may not be Retail Week’s place to say so, ‘identikit’ can quite easily be interpreted as ‘big name, chain stores’, and this only serves to underline how integral independent retail will be to the renaissance of the high street. There is no doubt in my mind that the answers to the high street’s problems are out there, and that they will be found eventually, but that process can be given an almighty kick up the backside if the independent retailers seek to act with innovation and revival at the heart of everything they do. Nigel, Chief Executive of Retail Trust. 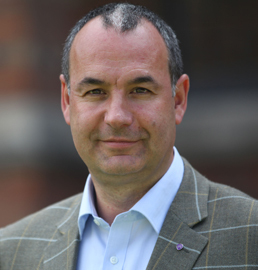 Nigel is Chief Executive of Retail Trust. Born and bred in Manchester, Nigel has spent 37 years in the retail industry. He started his career with BHS and spent eleven years in various store management positions. He then joined the Burton Group (which became Arcadia Group) as an Area Manager, holding various senior management positions throughout his 14 year career with them. His last position at Arcadia was Retail Director. In 2000 Nigel was appointed Retail Managing Director of The Body Shop and spent 3 years there. He took up his current position as Chief Executive Retail Trust in December 2003. Retail Trust is the only charity looking after the needs of all three million people working in retail and those retired from the sector and associated businesses. Retail Trust operates a free and confidential Helpline 0808 801 0808 which provides vital support and a range of services including access to: hardship grants, free counseling, free legal and debt advice, and help with redundancy as well as retirement housing throughout the UK. He is the Chairman of the ELLA Foundation and sits on the advisory board of the Oxford Summer School. He is a founder member of The Professional Speakers Association and a member of the Institute of Directors. Nigel is a regular spokesperson for the principle retail charity in the media. This entry was posted in Independent Retailer Month - Blog-a-day for #IndieRetail and tagged retail trust. Bookmark the permalink.